Archbishop Ryan’s Tyreek Chappell notches the first of his four rushing touchdowns in a 45-20 nonleague victory over Springside Chestnut Hill. 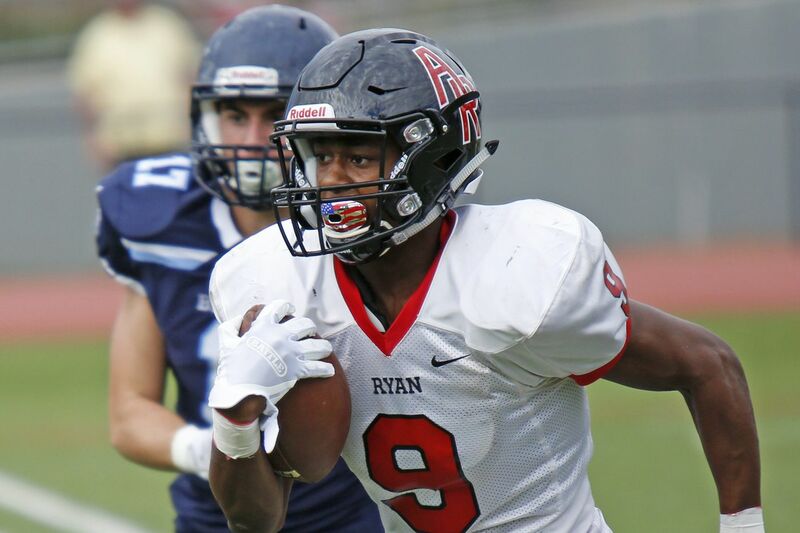 An up-and-coming sophomore easily switched to a new position on offense while helping Archbishop Ryan overcome a rash of injuries and stay undefeated. Moving from wide receiver to running back, Tyreek Chappell ran for four touchdowns on Saturday, as the visiting Raiders cruised to a 45-20 victory over turnover-prone Springside Chestnut Hill Academy in a nonleague contest at Maguire Stadium. "I just wanted to do whatever I could to make sure our team kept moving in the right direction," the 5-foot-11, 165-pounder said. "In this game, we had to do it without some of our regular guys." Taking the place of injured junior Julian Jones, Chappell carried 14 times for 219 yards. With his quickness and open-field vision, he scored on jaunts of 48, 50, 34, and 19 yards. "I'm pretty confident that I can make something happen when I get the ball," the 15-year-old said. "But I couldn't have made those plays without the blocking I got from my teammates." Chappell caught two TD passes last year. One of the them came in a Catholic League Class 5A semifinal playoff win over Archbishop Carroll. "I feel like his confidence has grown so much since last season," Ryan coach Frank McArdle said. Archbishop Ryan’s Tyreek Chappell (left) breaks up a pass intended for Springside Chestnut Hill Ke’Shawn Williams in the second quarter. Chappell, also a starter at cornerback, is a sprinter in track and field. The North Philly resident played youth football for the Oxford Circle Raiders. "We saw him play a few times, and we knew he was talented," McArdle said. "We were fortunate that he visited Ryan and immediately had a good feeling about what the school had to offer." When he was 13, Chappell ran the 40-yard dash in 4.6 seconds, the 200 meters in 22.9 seconds, and the 400 in 52.9 seconds, he said. "He can do a little bit of everything," Ryan senior quarterback Jahlil Sanders said. "He's got good hands, he runs away from people and jumps over them to catch the ball." Archbishop Ryan quarterback Jahlil Sanders is tripped up by Springside Chestnut Hill defensive back Phil Wrede during the fourth quarter. The Raiders, who will open Catholic League Red Division action on Saturday night against Father Judge, improved to 5-0 overall. The Blue Devils, who were hurt by five turnovers, dropped to 3-1. Chappell's second-quarter interception and 14-yard return set up a 33-yard field goal by Gavin Dionisio that produced a 24-7 halftime lead. Ryan's defense was led by linemen Chris Brown, John O'Brien, and Taleeq Robbins, linebackers Sanders and Colin Boyd (two INTs), and backs Kyron Long and Mekhi Lang. The Raiders finished with five sacks. Long returned a second-quarter fumble for a 29-yard touchdown and caught a 16-yard TD pass in the third. Springside Chestnut Hill receiver Ke’Shawn Williams lands on the goal line for a touchdown against Archbishop Ryan during the first quarter.